Amentior: Amentior Review: The Hoff Strikes Back! A Cranky column that may become regular if I gave a rip about culture enough to review it! How about that weird commercial on Comedy Central advertising "The David Hasselhoff Roast?" For the record, yes, Dean Martin is dead. The commercial shows The Hoff in a combination of the car wash scene in "Cool Hand Luke" and his reality clip from 3 years ago showing him shirtless and drunk on the floor trying to eat a Wendy's hamburger. 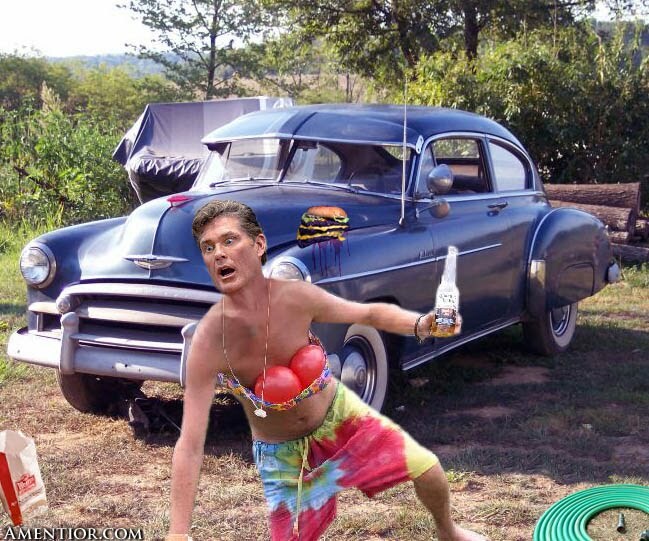 The commercial spot shows Hoff rubbing the car with his hamburger and then sobbing and eating it. I thought it was funny and gave me hope that The Hoff may one day be big as big in Pennsylvania as he is in Germany. Honestly, what do you want? Hamlet soliloquy's from this guy? Vincenzo however was outraged. "D--- waste of food and sacrilege to that cool car! A cow sacrificed himself for that ----!" Before you can yell "Thank you Pamela Anderson!" Vincenzo said he was hungry and left to forage the jungle. I thought that the Hoff had turned the corner when he cameoed on the Spongebob Squarepants movie. Alas, no.